Here’s a big, beautiful, easy-to-grow perennial, offering a commanding, shrub-like presence from June through September. In late August, ‘Desdemona’ erupts with beefy, daisies-on-a-bender blooms that last a solid three weeks. Bloom time depends on exposure; plants grown in mostly shade bloom later, and one of mine is just hitting peak bloom now, as we enter the second week of September. Leaves are leathery, huge, rounded, and deep green, with purple undersides and petioles (leaf stalks). Topsides of newer leaves contain purple veining; leaves are born in great abundance throughout the plant’s mounding form, and look great all season. ‘Desdemona’ will grow from three to four feet tall, with an equal spread. It’s a good plant for the middle to rear of the bed, though I’ve seen it planted boldly to the front in large beds. You sure don’t want to plant it where you can’t see the foliage. One of mine sits right alongside a pathway. If you have a spot that is shaded in the morning but receives from one to three hours of afternoon sun, or three or four hours of sun at the very end of the day, that’ll work too. All you have to supply is ample water. Ligularias love moisture, similar to Astilbes. This is a great plant for a bog or moist, low-lying area. They also look great alongside ponds and streams. I grow three, scattered around my informal beds, and remember to water them deeply twice a week. A two-inch layer of mulch around the plant, applied on or after June 15, helps keep the soil moist and cool. Bloom color is distressingly close to orange, but it’s best described as a yellow-orange. The plant is not terribly particular about soil type, but like most perennials prefers soil that has been amended with organic matter, as this helps the soil retain moisture, among other benefits. The plant rarely requires division. I divide every five to six years, just to make more plants. Deadheading does not encourage rebloom, but will keep plants looking good after flowers have faded. You may want to prune off the larger leaves later in the season, if they become tatty. Combine ‘Dentata’ with other shade and part-sun plants with spiked, long, or serrated foliage. 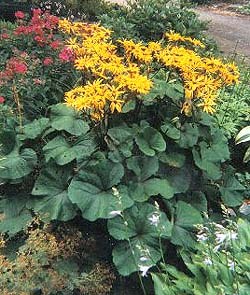 The plant combines quite nicely with the popular Ligularia stenocephala ‘The Rocket’ and L. przewalskii in addition to hostas, ferns, Pulmonaria, Thalictrum and Heuchera. Hardy to Zone 4, worth a try in Zone 3 with good fall care and winter protection.